You’re probably wondering who would grow a garden for their goats. We are those odd people who do this, but it’s not just for the goats. Her name is Violet and this is her Garden of Eden. Over the past several years I’ve struggled with my gardens during the summer in SW Florida. The weeds, the insects and the humidity are so extreme by July and August that I can barely stand to go outside. I don’t want to pull weeds in the summer and I’ve had enough of the fire ants. One summer I let the weeds take over and it was back-breaking work to reclaim my garden in the fall. Another year I spread black plastic over everything. I was hoping it would prevent all weed growth. The weeds still managed to survive somehow and the black plastic disintegrated quickly. It didn’t look good and I had to send a bunch of plastic to the landfill. I felt terrible about it. Last summer I put down weed mat fabric so the water could still get through but the weeds wouldn’t get the light they needed. This worked, but it still wasn’t my solution. The fabric shredded easily and had to be staked down everywhere to stay in place. I found it difficult to plant around it and I wasn’t happy. These methods might work great for many others, but they weren’t working for me. This summer I tried something new and it is the answer I have been searching for. Our dairy goats love to waste hay. They are messy eaters and once the hay hits the ground they won’t touch it. I have been collecting all their wasted hay (it’s a lot) and putting it on my gardens. This has kept the moisture in the soil and provided awesome insulation against the heat. I planted sweet potato and tropical calabaza pumpkin vines which quickly covered the ground. The weeds are much more manageable now because there is only a small patch here and there. 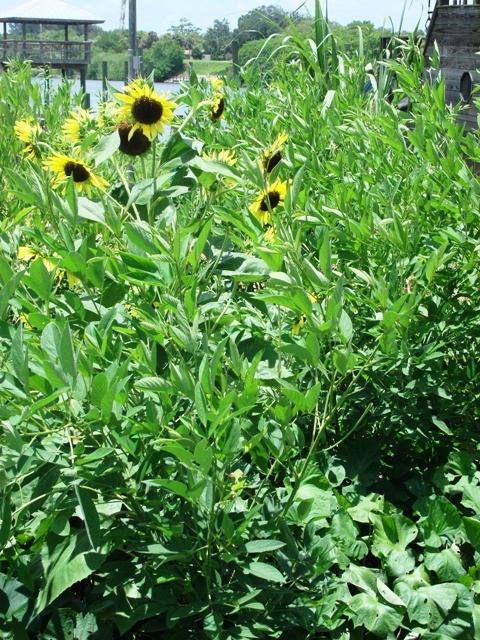 I also planted some heat-loving sunflowers and pigeon pea bushes. It looks like a jungle, but it’s a jungle of food instead of weeds. 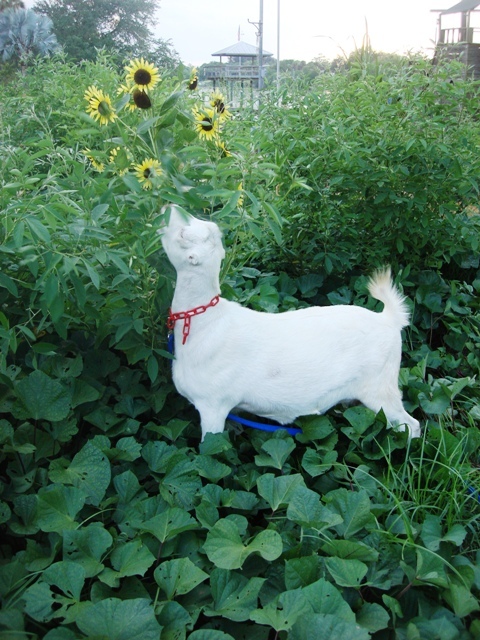 When I’m ready to mow it down to plant vegetables in the fall, I’ll let the goats finish it off. This has worked out so well that I’m hoping to do it every summer. 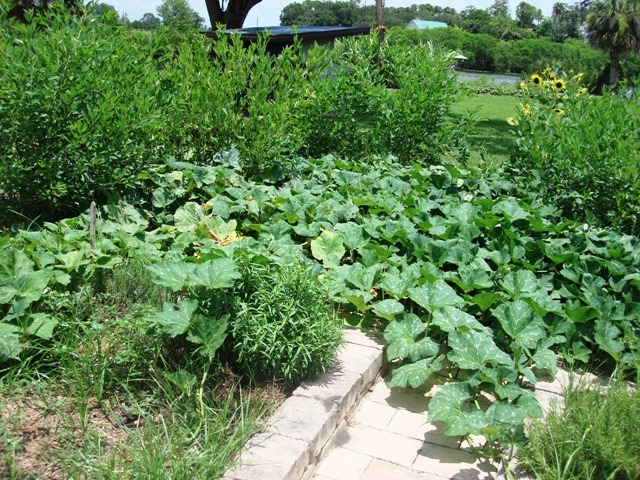 Tropical pumpkin vine spreading everywhere and keeping the weeds down. It thrives in the heat and humidity. It has some insects but doesn’t seem too bothered. A friend told me she had trouble with this method because she ended up with some treated hay that prevented growth of any kind in her garden. I was afraid to use my hay for a long time because I didn’t want this to happen to me. Another reason I was told not to use hay was because it might come with weeds in it that would germinate. My garden has never been weed free, so I was willing to take the risk. Ideally, the hay should be composted first, but I’m just not going to do it. I’m happy to report that I’ve been using my hay as mulch for over a year now and it has done wonders for my gardens in every season. 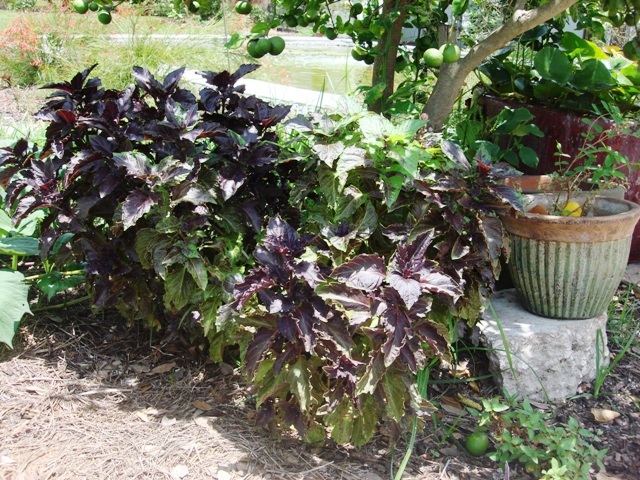 Sweet potato vine and Indian gongurra. I still need to pull weeds this summer in some of my garden beds that don’t have much planted in them. The past few weeks have been so hot and humid that I’ve resorted to throwing the hay on top of the weeds to smother them instead of pulling them out. There are probably lots of reasons not to do this, but it’s working out great for me. It’s keeping the beds looking tidy. I’ll deal with the weeds when the threat of heat stroke goes away. I’ve kept my basil from frying to death this summer by planting them under my kaffir lime tree. They’re doing really well with the protection. 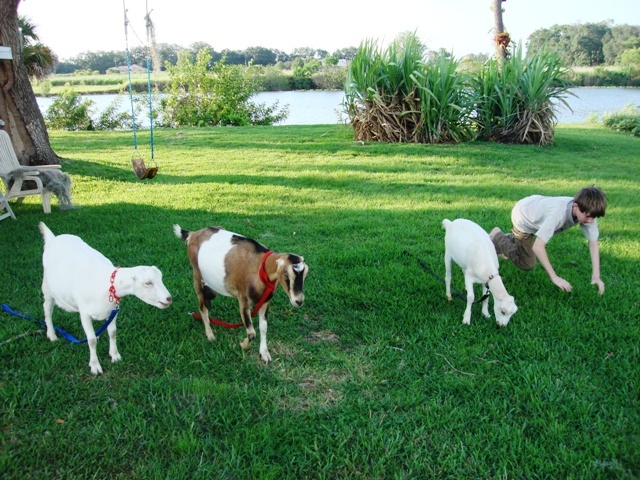 We walk our goats to their garden several times a week to help them get some exercise. These dairy goats have been such a win-win for us. There’s no going back to life without them. This entry was posted on July 8, 2012 at 12:36 am and is filed under Solutions with tags Dairy goats in florida, gardening in the summer, growing sweet potatoes in SW Florida, Pigeon peas in Southwest florida, plants for a florida summer garden, plants for goats, solutions for weeds in florida, tropical calabaza pumpkin, using black plastic in the home garden, using hay in the home garden, weed mat for home garden. You can follow any responses to this entry through the RSS 2.0 feed. You can leave a response, or trackback from your own site. never tried it myself but would love to see if it could help take care of some of the fierce nematode problems I’ve encountered. That’s a fantastic link… thank you! It’s an interesting legume. I wish they didn’t give it the common name ‘hemp’ though. It sounds too much like the plant we’re not allowed to grow when it isn’t even related. I found some more articles on it and it seems that ruminants won’t eat it when it’s fresh, only dried. When dried, it can be poisonous if too much is given as fodder. They suggest no more than 10% for cattle. It would great for a nemotode problem and fixing the nitrogen for the next crop. I’d never heard of it before. Thank you for sharing! 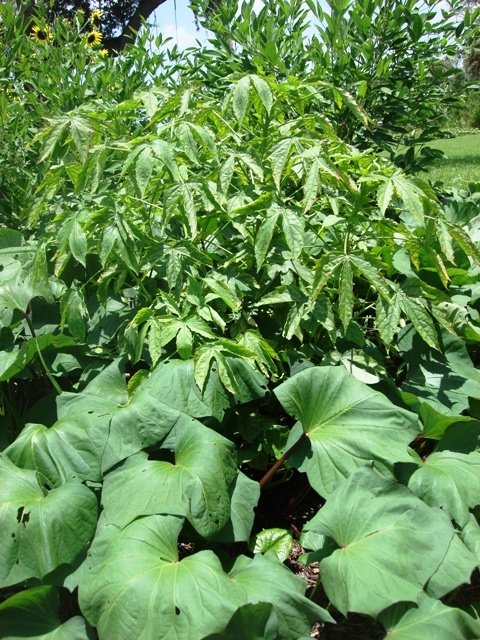 I know of a lady in Miami that uses sunhemp. Her blog is littlerivercsa. I love your articles!! We are in West Central Florida and encounter many of the same problems you have in South Forida. I raise rabbits and they waste a lot of hay as well. I have been using it in the very same manner in my garden. Our winter garden last year was the best ever. We also have Nigerians and several breeds of chickens. Surfing may already have gone to the dogs, but now it’s going to the goats too. According to ABC News, two goats named Goatee and Pismo are taking their surprising surf talents to the California waves. The farm animals learned from their owner Dana McGregor how to hang 10. McGregor said he decided to teach his pets to surf because it is one of his favorite hobbies. He figured that the goats might enjoy some board time too, but even he was shocked by how quickly they took to the water. McGregor taught Goatee to surf first, taking her to the beach and then putting her on the board. After her success, McGregor started giving lessons to Goatee’s son Pismo as well. Now both goats and McGregor frequent San Onofre State Beach, wowing visitors with their unusual skills. Goatee and Pismo both know how to ride individually, but they especially enjoy tandem rides. Next time you visit the beautiful beaches of California, keep an eye out for two sets of hooves hitting the waves. Our fire ants rule the yard. They’re very hard to live with but I’ve learned to do it… same with the bermuda grass. I DO love the calabazas! I find them to be a easy to grow in our zone and very rewarding.